FC Halifax Town defender Danny Hone has been ruled out for around six weeks with a medial ligament injury. 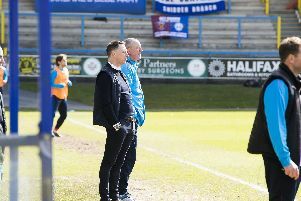 It is a recurrence of an injury he sustained at North Ferriby last season and which occurred again in Halifax’s 2-0 win at Gloucester on Saturday. Town boss Billy Heath said the injury was “not as bad as we first feared, it could have been a lot worse”, but is disappointed he will be deprived of the centre-back, who has come under criticism from a section of Town supporters. “It’s a big blow,” Heath said. “I’m not understanding why some fans aren’t happy with him - that’s the world we live in. “He’s a leader, he’s experienced an he knows this league inside out. “That’s why we brought him here. “Centre-back is an immensely important position and you have to get that right. “His performances have been excellent. See more from the Halifax manager in Friday’s Courier.